RIO DE JANEIRO, BRAZIL – Brazilian President Dilma Rousseff has until November 30th to decide whether she will veto sections of a controversial new bill, set to see oil royalties distributed more evenly among all Brazilian states. Late on Tuesday, it was reported that Rio de Janeiro governor Sérgio Cabral will lead a rally to protest the bill on November 26th in Centro. 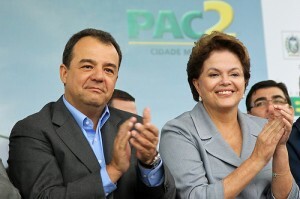 President Rousseff and Rio Governor Cabral, photo by dilmarousseff/Flickr Creative Commons License. At present, oil-producing states such as Rio de Janeiro, Espirito Santo and São Paulo, together with the federal government, receive the vast majority of royalties paid by oil companies in Brazil. The trio of states will see their share decline under the new royalties bill, and they are now pinning their hopes on a presidential veto. The issue hit the headlines last week after the contentious legislation was passed by a comfortable 288 to 124 majority in the Chamber of Deputies, Brazil’s lower house. Brazil’s Senate gave its approval last year. The bill would affect not only royalties from new production, but existing production as well. “[President Dilma Rousseff] has the ability to veto the part of the bill which deals with contracts already signed, and approve the part that regards new auctions,” the governor of the state of Rio de Janeiro, Sergio Cabral, said after the vote. Cabral said he is in constant talks with the president and is “confident” she will use her powers to alter parts of the bill. It has been a long-running battle for the state, and just last November an estimated 150,000 people took to the streets in protest. Off-shore oil royalties are under dispute again, photo by Arquivo/ABr. 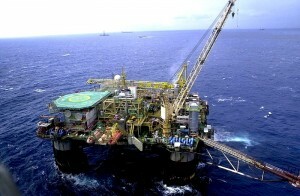 The majority of Brazil’s current oil production comes from oil fields off the coast of Rio de Janeiro and São Paulo. The discovery of huge deep-water ‘pre-salt’ oil reserves has heightened tensions over how future royalties should be shared between Brazil’s 27 states. Under the new bill, about forty percent of revenues that currently go to producing states and the federal government will be redirected to the country’s other states and municipalities. Rio’s Cabral estimates that the new law will cost Rio R$4 billion next year, rising to a total of R$77 billion by 2020. The loss of revenue will threaten the state’s ability to host events for the 2014 World Cup, including the final match, as well the 2016 Olympics, he said. Rio and the other producing states could still challenge the bill in the Supreme Court. The bill’s approval last week by the Chamber of Deputies is an important step for the development of Brazil’s oil sector, however, as it opens the way for two oil concession auctions next year, ending a five-year hiatus. The first auction is set to take place in May 2013, with the sale of rights to 174 conventional oil blocks, half of them onshore and half offshore. A majority are likely to be located in the Equatorial Margin, a new offshore area near the mouth of the Amazon River. A second auction is scheduled for November 2012, this time focusing on Brazil’s ‘pre-salt’ region.